Levanna is a stunning doe who represents many things we are looking for. 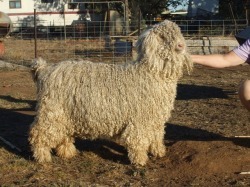 She is a big heavy doe and cuts very heavy fleeces; she is structurally sound; her fleece is extremely even from front to back with good style and character. She is a reasonably fine doe, testing at 28 micron on her third fleece. Levanna has been shown successfully a number of times, achieving Reserve Champion Doe at Canberra Royal 2008 and Melbourne Royal 2008 as well as a number of blue and broad ribbons at local shows. An old faithful doe who has stepped into Geri's boots as herd queen, and filled them remarkably well. She consistently throws stunning doe kids, which have been shown successfully. 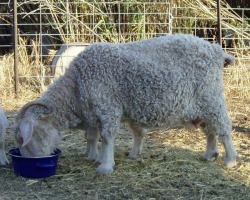 Sweet Pea is a doe who combines high quality fleece and very large frame - she is a big girl and her kids are the same. Our doe herd consists mainly of genetics from Daryl Finch’s very successful Sunny Ridge Angora stud, with some animals also sourced from John and Janet Leigh’s Phezulu Stud, Nick and Kate Gorrie’s Dulark Stud and some commercial does from various local breeders.